Quantified Self is a topic I've been deeply interested in for the last two or three years, and 2016 was a huge year for me with self-tracking. I dropped off a lot of my tracking in 2017 because I thought I didn't need it, and in retrospect I think that was a poor choice. I'm going to be adding things back through the year, and I think I'll use this as a reocurring series. Most of what I tracked in 2016 was focused on helping myself answer questions about how happy or content I was. Tracking mostly irrelevant information is a staple of Michael Aranda videos and seems like a fun addition. So for no good reason, I'm going to snap a photo of any new type of tea I drink this year. Tea isn't something I drink much of; it's one of a handlful of foods where my enthusiasm strongly ebbs and flows over time. Since I'm in a tea mood it'll be interesting to see how long it lasts. I don't have a formal method of collecting this data yet, so for now I'm logging it in a google spreadsheet and snapping a photo of each new one. (A comprehensive review of my data collection methods is necessary, especially since it will change a lot this year). I've been tossing around the idea of coming back here and continuing to record the stories of my life and travel. This started as a way to share life to loved ones far away while living in Saudi Arabia, but has become a valuable record of my life. I love being able to reread the details of the two years I documented and it's surprising how many of the details I no longer remember. It's been so long that I feel like this is more like starting over rather than picking something back up. In the spirit of starting over I decided to change platforms, get my own domain name, and refresh the look and feel of this place. I also want to have a gallery of my photos, which I didn't have before. I have much to say about my recent vacation to Budapest, and beyond that, time will tell. Aka my job has been taking over my life! I have spent so much time working lately due to various problems and issues at work that I haven't had much of any time for crafting in the last three months. My life has revolved around working, sleeping and maybe just maybe grabbing some food in between. It's coming to an end however and I can finally work on having a real work/life balance for awhile. Or at least until the next problem rolls around, as it undoubtedly will. But all the work has definitely been worth it, both in overtime pay which has helped us save for a house faster and in experience at my job. I've now worked through some of the most challenging situations we're likely to see, and now I will be much better prepared if heaven help us they happen again in the future. I've also gotten a chance to do some networking with managers from other mills as they have come in to help us from time to time. Now that I've gotten off track talking about work, it's time to focus on the fun weekend activities instead! Ages ago I saw a cute door decoration on pinterest courtesy of Marsh madness and I knew that it would eventually make a great front door decoration. Our last front door decoration which we put up just before Christmas only lasted until about February until Steve declared that it was clearly a winter wreath and couldn't stay up any longer. We ended up going nearly five months without anything pretty on the front door because I just didn't have time to devote to crafting or even buying anything. With work settling down, I took a trip last weekend to Joann's to see what kind of fun goodies I could find. I ended up with several cute storage boxes to use in our linen closet, tissue paper for another craft (coming soon! ), a cute wooden letter and a roll of decorative packing tape just because I thought it looked pretty. I also found a cheap certificate frame at Home Goods that was just what I wanted for this project. Originally I thought I was going to paint the wooden letter, but then I realized how fun it would look with the packing tape wrapped around it! 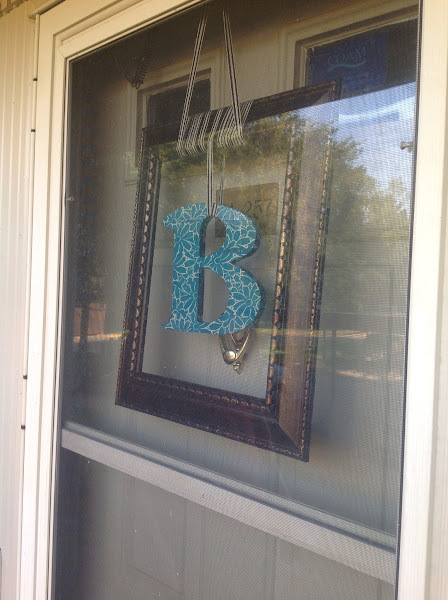 The frame and partially taped letter. See how well they go together! I never would have guessed that this combination would be exactly what I wanted. I used a razor blade to cut lines in the packing tape so that it would go around the curves smoothly. There were a few places where i should have cut smaller pieces for a better fit around the curves, but it still looks so pretty. I didn't cover the entire back of the letter because it won't really be seen and the packing tape was $7 a roll! I used some of my free ribbon from Steve's grandmother from my awesome ribbon rack to wrap around the letter and the frame so that I could hang it. It does clatter a bit when we open and close the door, so I might have to find a better way to secure it if the noise ends up bothering me, but if it doesn't then all the better! It's taken us quite a bit of time to get to the point where we feel comfortable buying a house, but I'm so glad we got there. We started thinking about buying a house back in late winter but didn't feel we were really ready for it. So we decided to boost our savings so that when we did finally feel ready, the money would be right there waiting for us. Fast forward a couple months and we decided it didn't hurt to start to see what was out on the market ourselves. We started looking at houses that were much closer to my job, sine I currently drive about 35 minutes to get to work. After driving by some available houses and through some neighborhoods we decided that being that much closer to my job wasn't going to work for us. We wanted to be in a nicer neighborhood and have good quality schools nearby for when there are school age little ones. Feeling a bit defeated by this realization, we moved back into the "renting is better" camp. Last month we decided we were ready to actually commit to buying a house, which meant we needed to figure out what to do next! We put in applications to get prequalified because the internet told us that was the right thing to do. After getting prequalified from our credit union we needed to find a realtor. Steve asked around at work and got a recommendation from a colleague for a realtor that was especially good with first time home buyers. Right about this time work got incredibly crazy for me, so Steve took all of the burden of contacting her and setting up an initial meeting. He thought she would be a good realtor, so I trusted his judgement even though I didn't meet her until we started viewing homes. Steve and I decided we want 3 bedrooms, 2+ bathrooms, and a kitchen that isn't too updated. I'm picky about what I want in a kitchen and have tons of good ideas on pinterest so I definitely don't want a house that has a kitchen that was recently updated. Our first tour of homes was several weekends ago. We looked at 6 different homes with various floor plans. Our main goal for that first outing was to narrow down any floor plans we especially did or didn't like. Turns out that I don't care for quad level houses (too many stairs) and we both really loved the layout of ranches. There was one house we both particularly loved. It was beautifully updated and had a lot of character which we both want in a house, but it was clear that it wouldn't take long for us to grow out of the house. The couple selling it clearly had 3 small kids and they were out of room. Cutest kitchen! Almost exactly how I would decorate it! But it was pretty small. This house had a cool first floor layout, but the location was terrible. The following weekend, we looked at 4 more houses and one of them, a ranch, caught out eye as being a fantastic house. It was quite reasonably priced and didn't need any work prior to moving in. In fact it likely wouldn't have needed work for quite some time as all of the big ticket items were pretty new. We did a lot of thinking and decided to go back for another showing last Monday. After looking it over one more time we decided to put in an offer as it really was just too good to pass up. Sadly, someone else put in a cash offer, which for the sellers is obviously more attractive. Naturally we were bummed that we didn't get the house, but we're getting right back out there and looking for something else that we will love. I had to work all weekend, so Steve went out on Saturday with the realtor to look at a few more potential houses. He liked one, again a ranch, enough for us to go back and take a second look at it. Steve thinks it will need some of the bigger items relatively soon (furnace, windows, and air conditioning) but its priced well to accommodate those requirements. We liked it enough to put an offer in today, but I'm keeping my expectations low as there have been a lot of showings on this house. Earliest we would hear back is Friday, so now we sit tight and wait some more! View of the house from the back of the property line! Tons of land, which is quite uncommon for the area. Ever since I started my new job back in January, my free time has been increasingly limited and I've been quite exhausted after work. For the first few weeks it was tortuous to come home and have to get something together for dinner and more often than I care to admit I just gave up and we either ate out or dinner consisted of milk and cereal. One week got so bad that cereal was even my go to lunch option. Not healthy. Not at all. To do something about this I decided to try cooking a weeks worth of lunches and dinners over the weekend when I had much more free time and energy. I started slow only doing 2 recipes at a time on Sunday but now I can easily make 4-5 meals plus a tasty treat. In all I spend about 4-5 hours cooking but it has varied based on what I'm cooking. There are really easy ways to shorten that time too like having one recipe use the crock pot and having another be a stove top only recipe. Another benefit is that all of the prep work is consolidated. Instead of getting everything ready to chop vegetables each day, I just get it out once chop everything and then I only wash it once too. Read all of your recipes before starting and get a feel for what order to work in. Start by getting out all of your dry ingredients so you don't keep going back to the same cabinets half a dozen times. Have some fun music or a podcast going! Here's a brief example of what and how I cooked a few weekends ago. I made 4 dishes: egg salad, And Noodles, Stuffed Shells, and Tacos. I started by cooking pasta and quick soaking beans. While that was on the stove I mixed up the sauce for And Noodles and preheated the oven. After the noodles were done they went into the sauce and then into the oven. Using the same pasta pot I started cooking the shells. I also started the eggs to hard boil. Then I got the cheese filling ready for the shells. By the time the shells were stuffed and ready to go in the oven, it was time to take out the And Noodles so I only had to preheat the oven once instead of twice. I chopped up the vegetables for the tacos and egg salad while the beans finished cooking and then used the pot from boiling eggs to make some brown rice for the tacos. At this point all that was left was letting the food cool before I packed it into individually sized portions in tupperware. Since I'd ben rinsing dishes off as I went and the dishwasher was empty all I had to do was load it and the kitchen was clean. It's gotten a lot easier for me over the last few weeks as I've perfected my routines and it also helps if you do all of the grocery shopping a day or two prior since Sundays at the grocery store are always crowded. Whew it seems like I've been away for far too long. I we'll say that I gave up blogging and snark for lent. One of those worked much better than the other. I was ready to come back last week, but then life exploded in a really terrible way. Now life has settled a bit and that Easter is almost here it's time to get back on the blog train. And now that work has seemed to settle down over the last few weeks and I'm sleeping better there is finally time for us to catch up on life. There's so much to share too, but I won't overwhelm you too much today. Over the last several months Steve has been working with a local high school as a mentor for their FIRST robotics team and two weekends ago we got to go to one of their competitions. It was especially exciting because it was hosted by the team Steve's been working with and it was at his old high school. Steve's dad was also the head referee at the competition so we got some high level insight into some interesting fouls and replay situations. The gym was packed. It only got more and more challenging to find good seats as the day went on. Steve's team in the stands watching and supporting their robot. What is a high school event without awkward group dance moves? Many of the teams had team number signs as another sign of support and recognition. I was skeptical at first but after watching a few of the matches I became a huge fan. The game this year is called rebound rumble and focuses on shooting baskets and balancing the robots on teeter-totter type boards. It was really cool to see all the different designs and shooting mechanisms. The teams had 4 baskets they could use to score. The white border is a special reflective coating that most teams used to help line up the robots for shooting. Steve's team had an extendable arm that allowed them to get much closer to the top basket, which was worth more points than the lower baskets. Another shot of team 548 in the process of shooting. Team 703 did a great job playing defense in the final matches, although I'm not sure this was a totally legal move. Every so often, 548 would struggle to make it over the center line, which had a bit of bump to get over. In this case, getting stuck was not a concern. The qualification matches actually started on Friday but we only went to the Saturday matches. We got to watch Steve's team play 2 of their qualification matches. The team ended up in third place after qualification and they got picked by the first rated team to form an alliance for the elimination matches. During the lunch break we had to rush home so I could change into my glasses because I'd managed to rip a contact and didn't have any spares since I've been wearing my glasses so much lately. We ended up missing the first elimination match because we got back late but all of the other ones were really great. The third team on the alliance was from Dexter where they had tornadoes come through recently. Their group became known for spinning like tornadoes when introduced. The teams have student drivers that use gaming joysticks or controllers to move the robots. They also have cute, little netbooks to run some of the software like the camera on the robot. In the elimination round, balancing three robots on a single board was worth 40 points and in the finals our alliance managed to pull it off several times including both final matches. Steve's team balancing with two other teams in one of the final matches. The coveted triple balance isn't always possible because of the varying sizes of the robots. Balancing on the middle board was only important during the qualification rounds and you had to balance with the opposing team. Team 67 had a good mechanism to help stay on the board. Balancing on the boards is tricky and sometimes robots ended up toppling over. Most robots are stuck then and out for the rest of the match. I managed to find my way to the top of the bleachers a few times to try and get some photos without blocking other people. Overall I was impressed by the lighting in the gym. Even though I had my ISO up pretty high to compensate it was definitely one of the better lit gyms I've been in. After the matches were over, and Steve's team came in first I got to take a closer look at their robot. Most teams used a long board to mount their netbook and controllers; 548 used a briefcase instead. It was one of my favorite details of the day. They even made an ethernet connection through the wall so they could hardwire the computer to the robot. Finally some pictures from the north america international auto show, which was only oh a month ago. My parents and Allie came up for the weekend to go with us. Allie took a bunch of pictures too, so check hers out on her blog. I tried to pick some different pictures to show than she did. My mom in a porsche. Both of them in a porsche now. A part from the UofM solar car. One of the few concept cars at the auto show. It's basically a tiny two seater with the base being segway type wheels. Two extra seats in the trunk. This Tesla car was battery powered and the battery formed the flat base of the car. It was pretty freaking sweet. To go along with the jersey bracelets I made ages ago, I made a cute 5 strand braided jersey headband to go along with them! I used the tutorial from make it and love it. I had to go through the steps to do the 5 strand braiding several times before I got the hang of it, but the pictures in the tutorial make it pretty easy to figure out if, like me, you haven't done it before. Another tip for anyone who might want to try this out: I found the tucking the top of the braid under my sewing machine helpful because that held it very firmly in place. I had to tug and poke a bit to get the braid to be even throughout the length, but using my sewing machine as a paper weight meant it didn't pull out at all. This headband is especially useful now that my hair is so short! This is a cute little purse I made using two fat quarters and a few quilting scraps. It's a bit small for me to use, but I bet a little girl would love carrying around something this size! The tutorial came from make and takes, and as long as you can do basic sewing skills you can easily make this! I did make a few changes because I didn't have the ribbon recommended to use for the handles and the contrasting band. Instead I substituted some fabric scraps left over from my first quilt. I basically made two tubes of fabric for the handles and then sewed two lines down each handle (before attaching!) to give it a bit of stability. Since I wandered down my own path a bit with this project, whenever I got stuck I stopped and looked at one of my fabric purses that I love to see how I could emulate it. So if you get stuck, just look around for a similar project and see if you can use that for inspiration! I even has a cute little pocket on the inside! Another sewing project reporting for duty! Going an entire year sans sewing machine has given me a drive to use it whenever I can (although a full time job seems to be getting in the way lately!). It's so fun to turn a few pieces of fabric into something awesome and useful. The extent of my experience sewing clothes has been a bit of hemming because my pants are always too long. Not that I was going to let lack of experience stop me from trying out a tutorial for flannel sleeping pants. Making clothes is very easily more expensive than buying them, so I had to figure out if it was even going to be worthwhile to make them. Replacing with pants from Old Navy was about $10, which is hard to beat, but the colors and patterns available were pretty slim. Making pants ended up being less expensive only because there was a great 60% off sale on flannel at Joanns, which meant that a yard was only $3. I ended up using 2 3/4 yards for me and 3 yards for Steve. The tutorial I used from My Cotton Creations was really straight forward and it was very easy to do! This is the fabric Steve chose. The first step is to line up the pattern (an old pair of pants) and cut out the fabric. This is how the top band ended up. Originally I skipped the elastic band and just had the drawstring, but I had to go back and add the elastic because they did not stay up well without it. My new pants finished. Steve's aren't done yet, or I'd show those too! You didn't think I'd go past a holiday without doing a little bit of decorating for it did you? Of course not. Since I didn't have any good ideas in my database, I started by browsing pinterest for some ideas, and found a couple of cute ones! I wish I knew exactly where these directions came from, but once I hit this chinese website, that was as far as I could trace the source. Since the picture above was the extent of the directions I had to do some guessing as far as the size of my felt. I ended up using 4" tall felt and that made really nice shaped hearts, but you could go taller or shorter depending on your heart shape preferences. This is how I threaded 3-4 on string at a time. Doing this made the garland assembly move much quicker. I used red, pink, and white felt here, but it's hard to see the difference between the pink and red. To take the place of my twisted felt garland from christmas, I strung some of the hearts vertically instead of horizontally as above. And finally hung one last strand over the living room entry way. I've still got one or two more Valentine's day crafts to show, so stop back soon! Started work: got new glasses. This was a huge deal for me. I haven't worn glasses on a regular basis (ie hardly ever) since middle school. Thankfully Optimeyes is way above awesome and helped me pick out an amazing pair. Started work: have to wear a hard hat. Having long hair was getting to be more of a hassle than I wanted. I waffled so much about cutting it, but then I saw a hair cut I loved so I manned up and committed to cutting it. I got bangs cut for the first time in ages too and I'm currently love/hating them. When they're down Steve thinks I look like velma from scooby doo. Not sure if that's good or not but I've always loved velma! Digital cameras have undoubtedly made a great impact in my life. It's cheap and relatively easy to capture all of my important (and banal) life moments, sometimes in duplicate or triplicate. After our travels last year and the wedding, I've amassed over 9,000 from the last two years and have over 16,000 photos over the last decade or so. How many other people take dozens of pictures only to leave them languishing on a memory card or computer never to be seen again? Blogging has helped with this some because I've been able to share some of them here, but for every picture I've shared there are probably 10 that I haven't. To combat this, I've decided to go through every photo on my hard drive and delete any bad photos or near repeats. Thankfully all of my photos were already well organized as I keep them sorted into folders by year, month, and event with the exception of my college years, which are more awkwardly organized since they span calendar years. Deleting crappy photos has been much more time consuming that I ever thought, and it was hard go through all of them because they're all so sentimental. Even though I've gotten rid of over 6400 photos (40% of my photo collection!) not one of my event folders was emptied completely. It's so much easier to enjoy them now that there are fewer old photos and way fewer repeats. It also makes all the memories that much happier because I'm not coming across bad photos that make me grimace. Right now I've worked up to September 2010, but that still leaves nearly 6,000 photos to go through. When all is said and done I want to take all of the photos that are left and make photo books for each year, but I think that's a project for 2013 because that's going to take an immense amount of effort to do. Well I've gone and done it; I'm now an official resident of Michigan. Over the last few months I've had so many chances to go to the Secretary of State's office and get my license, but everyone I've ever talked to had horrible things to say about the experience, so naturally I procrastinated as long as possible. The only motivation I had for getting my license was the upcoming election. I already missed the elections in November because I never arranged to get a mail in ballot for ohio and I didn't want to miss another chance. If it weren't for our recent trip to the North America International Auto Show (pictures coming soon!) I probably would have put it off even longer. While we were walking down the main hallway outside the show room I saw the Secretary of State's booth and stopped in to see what it would take to get my license. I didn't have any of the necessary documentation to do it so it looked like a bust initially, but then they said they would be open weekdays until 8pm, including MLK day! The guys working the booth even told me it was the only SOS branch that would be open on the holiday. It worked out well to drive back the next day after work since the cobo center is only about 5 miles from work. Getting my license was so quick and easy. There was NO line to wait in! The hardest part of the whole ordeal was trying to drive out of downtown Detroit during prime rush hour. I swear I drove the same circle of blocks three or four times before I finally figured out how to get on the highway. I even had the gps with me, making it even more blush worthy. Now after five months, I'm officially a voting Michigan resident. It's been several weeks since we transitioned from a one car to a two car family and my main reaction has been one of an overwhelming sense of freedom. Even though I went a year without driving in Saudi Arabia, anything we needed to get to on campus was a short walk, bike ride, or bus trip away. I could hop on my bike and get to class in just a few minutes. A dinner out or a movie was a nice walk (in the winter) but after Steve started his new job here in August all of my trips had to fit in after work or on the weekends. There were a few times I debated walking, but really nothing is close enough to walk to in a few minutes though we are surrounded by a lot of great shopping options. Now with my own car (Wellington by the way) I can go anywhere, anytime regardless of anybody's schedule. My typical process for finding and doing new projects and crafts usually involves cool ideas staying open in tabs for a week, spending a few more weeks in a bookmarks folder, and then finally just maybe I'll get around to gathering all of the materials if I still want to do it. My canvas art project followed this path closely and ended up taking forever to finish because I kept running into road blocks. The next delay was completely due to laziness and forgetfulness because I needed to pick out stick on letters to use. 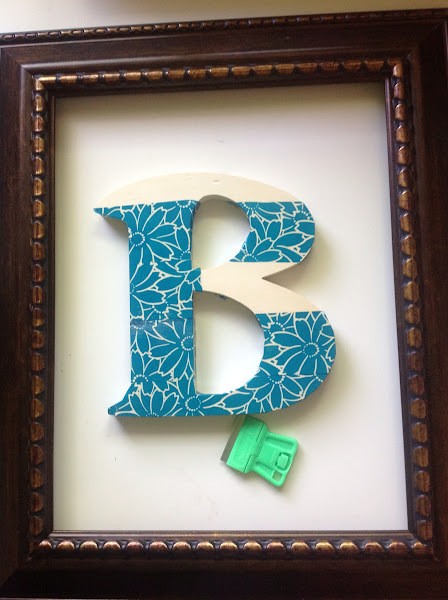 I wanted pretty letters that were at least an inch tall because the canvas is pretty big. I originally thought the canvas was going to be too big, but I liked how it looked in the end. After I got the letters, cut them out, and laid out on the canvas I thought it was going to be a quick and easy finish. Yeah, right. Turns out that scrapbooking stickers do not stick to canvas despite being great on paper. The letters a and n in the lower left corner were my starting point and they curled up and did not adhere to the canvas one bit. Discouraged, I did a bit of internet searching and found out that contact paper would probably stick to canvas. I didn't want to cut out the letters by hand so I decided again to wait until I was home so I could mooch off of mama. She has a sizzix machine and several alphabet sets which I hoped would suit my fancy. Thus over Christmas vacation, while Allie tried to best my glitter ornaments, I cut letters, peeled them, and painted my canvas. DIY tip: Tweezers were the best tool for peeling the contact paper and accurate placement on the canvas. Not wanting to free form the letters meant I had to forgo punctuation because the sizzix sets didn't have any, so I'm choosing to ignore that minor flaw. I know the paint looks blue here, but really it's much more purple like in the picture below. I let the paint dry for a few hours before peeling off the letters with the tweezers. The "y" had some paint bleeding, but very minor! Paint bleeding under the contact paper was a concern and it did happen a bit, but I think it adds a hand crafted look to the project. The bleeding was minor and from a distance you can hardly see it. Here's yet another project that has been finished since before the holidays, but I've not found the time to share it. I got a box of great ribbon (expensive too!) from Steve's grandmother when we moved in back in August and rather than leave it in the box where I would no doubt forget about it, I wanted Steve to make me a rack to store it on. I based mine on a set of photos I found on flikr via pinterest (and yes I want to copy them all, so fabulous) and made the dimensions so it would fit in the space next to the window in the craft room. Steve couldn't make the cuts to have the dowels pull straight out the front like the original, so he drilled holes in the sides and I pull them out to the right. One side has these cute wooden toy wheels stuck on and the other side has a groove cut into the dowel so I can slip metal clips into the groove. These clips keep the dowels from sliding out of their own volition and are easy enough to pull off when I need to take off a spool of ribbon. This was great to have around at Christmas; it made it so much easier to incorporate ribbons into my wrapping. I may prime and paint it at some point in the future, but for now, I'm pleased as punch! Happy Birthday and my New Job! I was supposed to start my new job last week, but it got pushed back until yesterday. I wasn't sure how it would go, and of course I had some nerves about it. I spent the whole day in safety training, and I'll be spending the next five days plus another two after that doing more training and orientation. Everyone was so genuinely nice. In my last job, safety training was important but really dull. Really dull. It was decidedly awesome and fun. The safety guy was entertaining and full of crazy random stories. He reminded me a lot of Ron Stoppable. My birthday cake was argyle and was delicious. All around a fantastic day. Probably the best birthday yet. As we get ready to leap into the new year, I thought it would be fun to look at some highlights from 2011, because it was a lovely albeit busy twelve months. We got Christmas presents in the mail! My first trip (of many) to the dentist in Jeddah! Labor Day trip to Illinois!